Hesder yeshiva student-soldier Netanel Yahalomi killed one terrorist and fired another 23 bullets until he was shot dead. Hesder yeshiva student-soldier Netanel Yahalomi killed one terrorist and fired another 23 bullets until he was shot dead, his father Shmuel said Sunday morning, several hours after his son was buried. He said that IDF officials told him Netanel, 20, was the first soldier in the combat force at the Egyptian border to spot the five terrorists. He immediately eliminated one of the terrorists and continued to shoot until a lethal enemy bullet hit him in the head. One other soldier was wounded and is in moderate condition in Soroka Medical center in Be’er Sheva. Hundreds of mourners were present at the 1 a.m. funeral in the Modi’in military cemetery early Sunday. 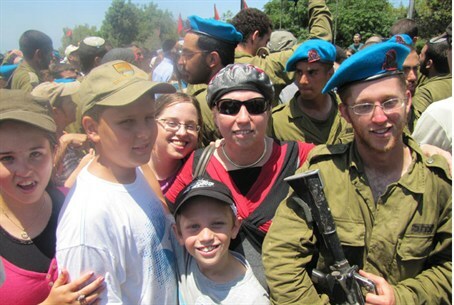 Netanel’s sister Avital described her brother, a graduate of the Mtzpe Yericho yeshiva high school who went on to learnTorah at the hesder yeshiva in Maalot, as a young man who wanted to give his utmost to his country, "and who couldn’t bear to see injustice." She added that he tried to study Torah whenever he could. "Even when he arrived home," she said, "it was important to him to study Torah." The IDF said there was no direct connection between the terrorist attack and the presence of African infiltrators at the border, but the terrorists exploited their presence by firing at the artillery combat force when several soldiers were bringing water to the migrants. Three of the terrorists were eliminated, and they were wearing suicide vests, indicating they intended to carry out a large-scale attack on Israelis. Two other terrorists escaped in Egyptian territory. The terrorists struck at a stretch of the border where a security fence is still under construction. Yahalomi’s unit was patrolling to guard against terrorists and the entrance of illegal immigrants. The terrorists were dressed in civilian clothing and followed the African migrants. When soldiers went to offer the migrants water, the terrorists emerged from their hiding spot, and approached the four soldiers who remained at the post. After the clash, IDF sappers recovered a large number of firearms and explosives from the terrorists, including and RPD machine gun, a rocket propelled grenade, Kalashnikov guns, ammunition, grenades, and personal equipment, indicating that they planned a massive attack once inside Israel. Netanel was born in Bnei Brak, the third of six children. The family was among the founders of Nof Ayalon, a religious Zionist community near Modi'in and administered by the Kibbutz Shaalvim Hesder Yeshiva. Despite a lowered profile because of poor eyesight, Netanal insisted on serving in a combat unit and joined the Artillery Corps, in which his father had served before him.